Pictures from the Convention 2014 Exhibition. 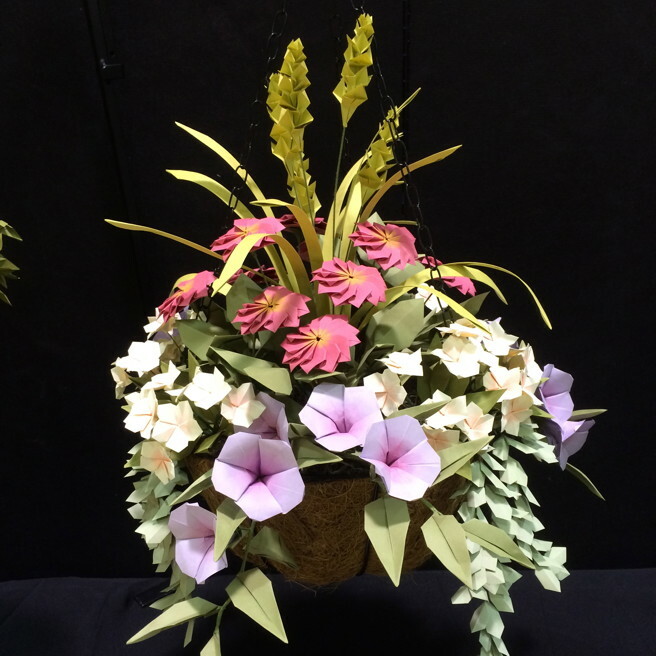 See more from the 2014 Exhibition here! 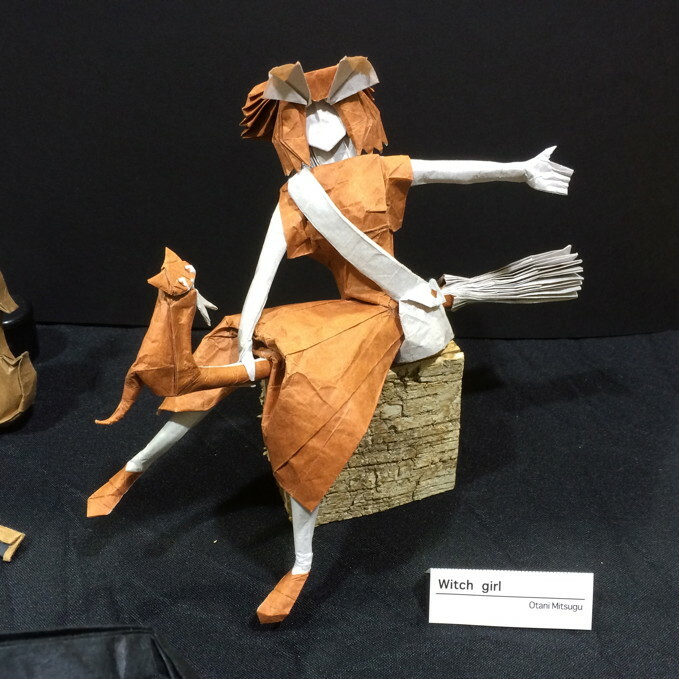 As in years past, the Annual Convention will feature an Exhibition of works by our attendees, which frequently includes some of the latest, most astonishing origami in the world! The Exhibition is open to all attendees as part of registration; in addition, there will be public viewing hours on Saturday and Sunday. Anyone can exhibit their artwork at the Origami Convention 2015, whether a single model or several, but space must be reserved in advance. If you plan on participating in the Exhibition, you must send your request to exhibit by June 11. Not all space requests can be fully granted (due to limited space), but we will try to accommodate all requests. You must be registered to attend the Convention to participate in the Exhibition. If you are not attending, and would like an attendee to facilitate the display of your models, that attendee must fill out the form and fulfill the volunteering requirements. Online registration for Convention Exhibition is now closed. Please note that there are no sales in the Exhibition area. If you want to exhibit at the convention, you'll have to volunteer to monitor the area for at least one hour. This ensures that the area is supervised at all times, and visitors really enjoy having knowledgeable artists available. Sign up for your shift when you set up your exhibit. 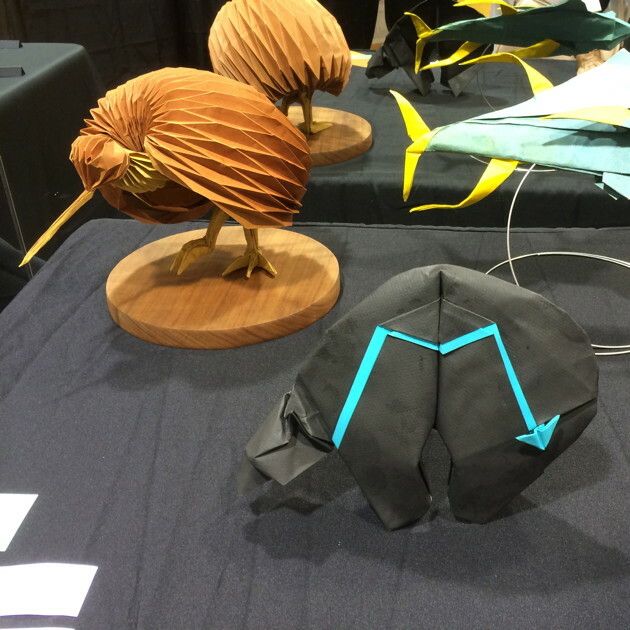 Note: If you are displaying your model as part of an Origami Group exhibit then a representative from the group is required to volunteer one hour for a half table or less, and two hours for a full table. You are teaching or volunteering for more than four hours on Saturday and/or Sunday. Your ATC (Artist Trading Card) is the only item you have on display (all cards are included). You have a model that is part of a table set aside by OrigamiUSA for a Design Challenge or Memorial. As optional information, you might also consider including the date of composition and folding; the medium (type of paper, paper shape), and/or the crease pattern, if available. In general, tabletop and/or wall space are available. When preparing models for display, please consider their appearance. If you are designing your own display, please include a sketch with your form. Any questions or concerns, please contact Ruthanne Bessman at convention-exhibition [at] origamiusa.org. Non-members, including family and friends of members, may visit the public areas (Sales and Exhibition) for a fee of $5 for adults, free for children under 12. Origami can be set up after 4:00 pm Friday and must be taken down by 6:00 pm Sunday. Exhibitors are asked to take down their exhibits on Sunday between the hours of 5:00 and 6:00 pm. Any work not taken down by 6:00 on Sunday will become the property of OrigamiUSA. Please note that Manhattan College will take possession of the Exhibition room at 4:30pm on Saturday for a pre-arranged private event. Tables that are in the center of the Exhibition will need to be moved to the sides. We will have staff there to carefully move the tables. If you wish to be there to move your exhibition yourself, you will need to be there at 4:30pm on Saturday, and again at 9:30am Sunday morning. Please indicate on the form if you will move your own exhibit. Please note that our security will be present during the Manhattan College event to safeguard your work. We do allow photography in the Exhibition for personal use only. "Personal use" means one's own records and/or posting on one's own non-commercial web page or social network page. OrigamiUSA will also post photographs of the Exhibition on our own website (see here for some examples). Photography for commercial use is, in general, prohibited; if you wish to take photographs for eventual commercial use, you must obtain permission from both the folder of the works and, if different, the creator of the original work. If you do not wish to allow photography of your work, please place a prominent notice to that effect within your exhibition space and we will ask visitors to respect that. Origami artwork is fragile and easily damaged; for this reason, there is no touching or handling allowed of the origami works on display without permission, for any reason. If you are photographing a work and you want to move it to get a better angle or backdrop, you must obtain permission from the artist to do so.